Happy free-cutting-file-Friday!! Woohoo! I love FREE stuff and this week doesn't disappoint! 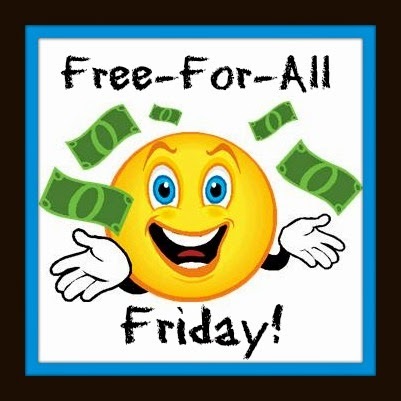 Below, find a comprehensive list of awesome companies who offer weekly freebies! 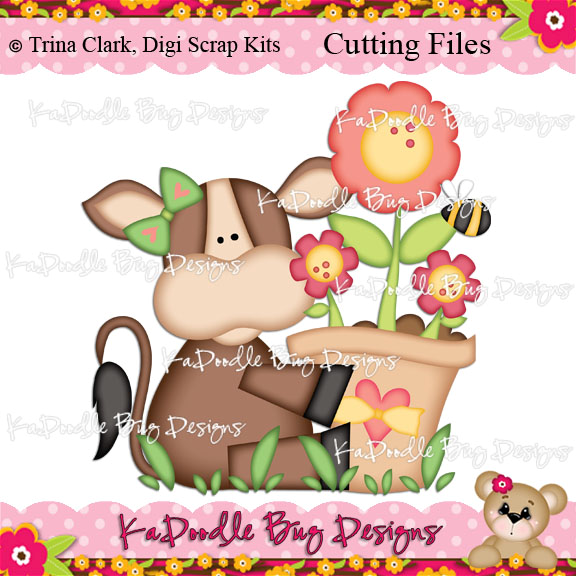 Rating pretty freaking high on the cuteness scale this week is Kadoodle Bug Designs' ADORABLE Spring Cow file. This pic makes me smile! Miss Kate Cuttables actually has a DAILY freebie every day of the week! Totally sweet and generous! Today's free file is a set of banners. Little Scraps Of Heaven You can access their freebies through their blog or their Facebook fan page. This week's freebie is a bee with a flower. KaDoodle Bug Designs publishes new free files on Mondays and corresponding digi files on Tuesdays. Now it seems they've really been outdoing themselves lately by also giving an assortment of free phrases each week! KaDoodle Bug is offering a set of summer titles and a super cute spring cow. Right now she also has a Wave card, but that's a surprise freebie that can change at any time! Treasure Box Designs offers a new digital file every Tuesday. They have some really cute stuff!. This week, they're offering an adorable Spring has Sprung title. Thanks SO MUCH to Karel for letting me know about this awesome company!! For those of you that own a Silhouette machine, don't forget that the Silhouette store has a free cutting file each Tuesday. You need to download the free program to your computer (even if you don't own a Silhouette machine yet) to access the store. Please keep in mind that the files aren't SVGs...they will only cut on a Silhouette brand machine, (SD, Cameo, or Portrait) so this will be a great option ONLY if you're planning to purchase (or already own) a Silhouette. You can download the free program HERE. This week's freebie is a beautiful Mother's Day floral card. They also have a "thanks" banner to celebrate 100k fans on Facebook. THERE IS ALSO A 20% OFF SALE ON THEIR SUBSCRIPTIONS THROUGH MAY 7th!! IF YOU DON'T HAVE ONE YET, THIS IS A GREAT DEAL! Designs on Cloud 9 They have adorable Teddy bears and other characters. Lots of cuteness on this site! This week we're being offered a flip flop banner. Pretty Paper, Pretty Ribbons offers a new free SVG file each Friday. She even offers a newsletter subscription to remind you. This week's freebie is a mushroom family. My Scrap Chick offers a new file each Friday to her newsletter subscribers. Click the link to subscribe. This week, the are giving us the cutest "hello" cut edge card. Birds Cards - is an awesome blog with all sorts of amazing freebies! On the blog this week is an awesome geometric birthday card. SVG Cuts offers TONS of free files! I believe they have said that there are over 200 of them available right now. Make sure to sign up for their newsletter too. Every time they send a newsletter, they include a new free file! Their latest offering is a sand dollar.